How can I help to increase the capacity for creativity through the introduction of an artist in residence into the art department? 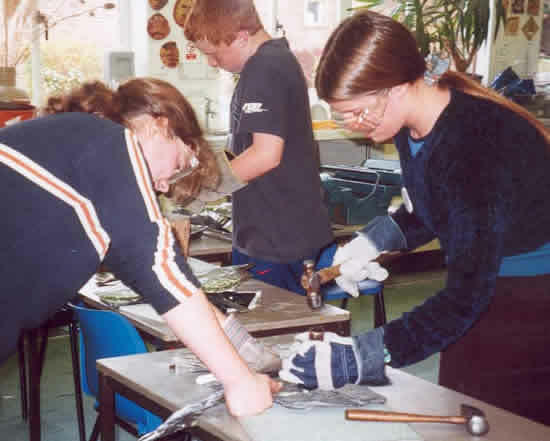 This action research reflects on the introduction of Melissa Cole, an Artist Blacksmith who I appointed to work on our sculpture park project with us in the Art Department at Westwood St Thomas’ School. The residency commenced in September 2000 and continued into 2001. My inquiry considers the benefits and impact of such a partnership and how it can increase creativity. Through the involvement of students, staff and a wider audience to produce impressive metal art forms and the subsequent celebrations of success, creativity is identified and a distinct increase is acknowledged. The research addresses the importance for a creative and cultural education by making both implicit and explicit references to both the NACCCE’s reports of 1999 and 2000 and to the creative activities taking place in the classroom. The methodology adopted is that of action research and my research instruments are reflective diaries, video, audiotape, questionnaires and statements. The inquiry concludes with a consideration of directions for the future and for further integration of creativity into the curriculum. “Creativity is possible in all other areas of human activity, including the arts, sciences, at work, play and in all other areas of daily life. All people have creative abilities and we all have them differently. When individuals find their creative strengths, it can only have an enormous impact on self esteem and overall achievement”. I considered that the introduction of an artist in residence into my department would be a valuable creative partnership and a strategy to offer new experiences for all, access creative abilities and to extend the excellence of art celebrated within the school to the community. This is my justification for my enquiry of action research, “How do I improve my practice?” (Whitehead,1999, abstract). My post conference review (PF5) advises of my passion to add value to education through a new learning experience to unlock participants’ full creative potential. By conducting this action research study I hoped to ascertain whether or not I have achieved this, has creativity increased? It would also be a means to question my capacity as a teacher and as a head of department. I hoped to discover the extent to which I am providing what is necessary for learning to take place? Through reflection of the Artist in Residence project I will review and plan future partnerships. It is this action research that has alerted me to the fact that my own personal creative and artistic philosophies are very closely entwined to my professional practice, not detached. This is an example of, “Educational theory” as Whitehead (1999) purports concerning living one’s individual values in one’s practice. A concern that I had with my proposal for my action research was that it might not be immediately obvious that it is about my own teaching. I had to validate the topic for my action research; this I did through discussion with Jack Whitehead. I also made reference to McNiff et al (1996, p24) to confirm that my action research claim was valid. My concern was that the nature of having an artist in residence means that often she would be addressing the class, not me. I deduced that my research topic was valid because it is about my professional practice as a head of department and a teacher and the residency partnership has direct implications for my management and pedagogical skills, my classroom, students, colleagues and department. I had established the “I” factor as considered by McNiff et al (1996 p17) for my research. Integral to my professional practice and this research is self-reflection; this is supported by Stenhouse’s (1975) critique concerning objective-led curriculum development and professionalism through, “The systematic questioning of one’s teaching as a basis for development” (Stenhouse 1975 in Bees 1995 p2). I will employ this hypothesis of review in conjunction with McNiff et al (1996) and NACCE (2000) (PF6) to assist with my analysis for this action research. My specific techniques for this action research will be to review an ongoing diary (PF9) in which everyone including visitors’ comment on what is happening with the project. For evaluation and assessment of the residency I had to think ahead and develop some strategies and tools for collecting evidence, data, examples etc. This was in order to satisfy sponsorship requirements and to adhere to some of the good practice partnership suggestions (Sharp and Dust1997) 7. The diary asks participants and visitors about their knowledge when first introduced to the artist and for review at various stages, it provides vital evidence for my research. Alongside this I will use radio interview recordings (PF16), video (PF13), project aims and objectives (PF7&8), Melissa Cole’s diary (PF11), my diary (PF9), questionnaires (PF12), press cuttings (PF14 & FIGs 2 &4) and photographs as data for this research. In accordance with the ethical guidelines for educational research (BERA 1992) I have addressed my responsibilities to all involved in this project and I have negotiated access and considered confidentiality. The beginning of the project saw a year 13 A level group working with Melissa. There are eight students in the group and by reflecting on the artwork of one student that has been produced with her, a performance about that experience and a two-day community activity, I will analyse the creativity that has taken place. 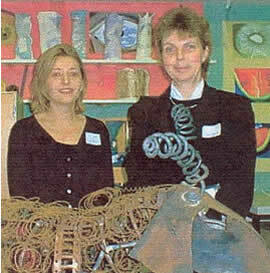 The students were to develop an idea from one of their projects to create a metal sculpture for the Sculpture Park. Laura selected a lobster from her still life project to develop. Her initial entries in the diary (PF10) are for 20th ­27th September, 2000: “It’s going really well, I’m enjoying making my design out of wire and tin foil. I feared I wouldn’t be able to do what I wanted but it has worked. Having loads of fun and learning really cool techniques. My lobster is coming along great.” From this evidence I was able to deduce that the diary as an action research tool on its own did not completely document the events. By employing Melissa’s entry from her diary (PF11), day 4, 29:9:2001 it gives a bigger picture and we observe Laura’s learning to work with new materials and skills: “Laura’s lobster is in pieces as she learns how to curve cold iron bars to shape.’ I am personally celebrating the creative environment but written words do not sufficiently relate the dynamics of the project. The visual, audio and kinesthetic learning has not been communicated. In order to do this I decided to employ one of Laura’s peers to video (PF13) the action. My implementation of new research tools for conducting the action research reveals that I have identified an indicator to show the process of change this reflects McNiff etal (1996 p64). It is in the video evidence (opening shot) that we see Laura handling and measuring metal. We see her using a template that she has drawn and then we see her hammering a rounded piece of steel on the anvil and later her finished piece (a slightly later frame). The video shows the three dimensional nature of the outcome whilst the following photograph (FIG1) is appropriate to present as evidence because it is more accessible than the video. The photograph immediately shows the evidence. 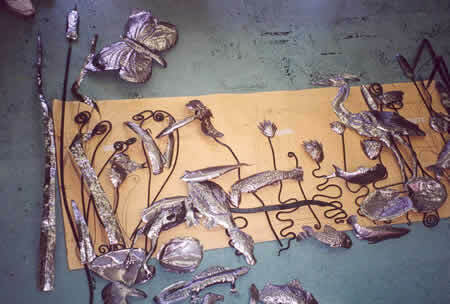 The process of realising a three-dimensional sculpture from a two dimensional starting point is clearly visible; this reveals that Laura has had a creative experience. The opportunity clearly measures creativity as proposed by NACCCE (2000, p2): “Creative ability develops through practical application and this involves using techniques and skills in the discipline in question.…. Creative processes involve using imagination, pursuing purposes, being original and judging value.” The opportunity for Laura to work with Melissa offered her a personal challenge that has resulted in a unique response in the form of a sculpture. This addresses the NACCCE’s idea of engaging a participant in an, “Active form of learning which engages young peoples’ creative energies.” ( NACCCE 2000p2). The action research clearly reveals what Laura did to increase her creative experience. occurs less often and only when you miss everything apart from your thumb!” Laura’s participation in these performances is evidence itself that the capacity for creativity in the art department has increased; it has provided information beyond the classroom and has entertained others. It also clearly offers the opportunity for accelerated learning to have taken place as discussed previously; Laura’s learning is multi- sensory. This is “gauging the impact” (McNiff et al 1996 p42). What I have described has been recorded; it has taken place; it has not happened before; I did not do it but as a teacher and head of department I organised, managed and created the opportunity. The evidence of FIG: 1 and PF12 supports NACCCE’s idea, “Creativity is not a single power but multi-dimensional.” (2000 p4). I witnessed, along with the audiences students relaying their multi-sensory experiences of working with metal and on the forge. It is unfortunate that the video film of these events is damaged but a questionnaire provided an account. As an action research tool I could have considered an audiotape as back up but further evidence was gained from exposure in the media. It could be read in the Salisbury journal’s account of the evening with the article’s heading, “Westwood: truly comprehensive in all senses”(30/11/2000 p17) (PF 14). The capacity for creativity has spilled into drama, students are talking about their art experiences and acting on stage about their experiences and it is raising the profile of the school. I present another newspaper article FIG: 2 to show that through the introduction of a forge, students were benefiting with a hands on experience. I believe that this “secures my judgement” as discussed by McNiff et al (1996 p43). The newspaper article provides information for its readers; the information that is being communicated is that new skills are being experienced. This is clear to see in the visual image included in the paper, creativity is taking place and the community is being told about it. Another measure of “securing judgement” is that since partaking in the residency Laura has decided that she does not want to pursue a Drama only degree at University, she is going to do a joint Drama and Art degree. This is evidence that the residency has added value to Laura’s art education because she now has decided to pursue the subject beyond school. 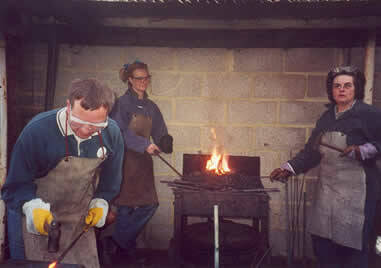 FIG2: Laura on the Forge (Salisbury Journal October, 2000). I set out to nurture a creative environment and Melissa confirms my intention with her diary entry on 21/09/2000: “Fantastic creative atmosphere….” (PF11). There is mutual respect between artist, students and staff; the learning environment is infectious and energetic. The day to day diary supports this and also demonstrates many of the benefits of a partnership as forecasted by Sharp and Dust (1997p1-10). It is such a benefit to have an artist as a role model to our students. Melissa is also an inspiration to teaching and non-teaching staff, students and members of the community and visitors. FIG3b: The results of the two community days. “The day was so different as I was working with people learning new skills and being creative. 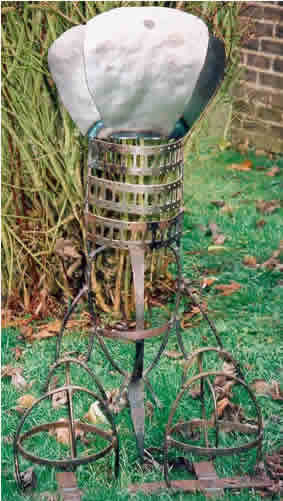 It was my first artistic attempt since school days and my first sculpture ever.” the bursar. 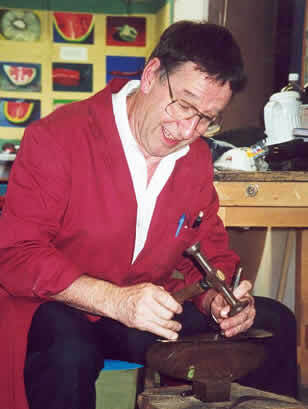 “Everyone was working and helping each other with different projects.” The caretaker is seen making a metal kingfisher. Having conducted the action research my findings are that creativity has increased, this is evident from the sculptural work, data and from the media exposure that the residency has obtained. I believe that the action research evidence reveals that the residency project is having an impact as discussed by McNiff et al (1996 p42), that of increasing awareness beyond the classroom. Various opportunities have been presented for me to make my findings public. This is evident in a radio interview when the creativity that has taken place and the outcome of a sculpture park for a school is referred to as, ”Unique…to work with such inspiring students and staff.”(Melissa Cole, BBC.Wiltshire, Sound, 11/11/2000) (PF16).I have shared the knowledge of my research with Educart, an art educator’s forum in Salisbury. This has been acknowledged in the Local press (Avon Advertiser 28/2/2001)FIG 4a and can be seen in the following illustrations taken by the school’s press officer FIG 4b. As action research tools, the talk and the press cutting advise how my own professional practice has been demanded to communicate to a wider audience about the residency and creativity. Such demands, and there are others, are a testament to the success of the partnership with Melissa (PF17-20) and the increased creative capacity. I believe that I have made the “connections” as the NACCCE’s report suggests (2000 p5). FIG 4a: The Avon Advertiser 28/2/2001. As I review my action research I refer to my original proposal (PF7&8) for the residency, I constructed this by addressing the NACCCE’s report (1999) and consequently it was framed around the issues of creativity and cultural development. I now note that I have successfully achieved the aims and objectives, hence this is an effective measure that reveals that I have personally achieved my goal of enhancing and increasing the range creative experiences. The action research that I have conducted has told about the benefits not the frustrations of a partnership. The frustrations are concerned with a wish list for more funding and accommodation. This is to be the direction for my future action research, I have been asked to work with the local council on a joint lottery bid that will involve the artist in residency continuing. This will be in an increased capacity and will see our students working with the wider community on creative projects. Finally, if I ask what else can I do to raise creativity? I refer to the NACCCE’s suggestion of a way forward with this final quotation: “ A head can make teaching for creativity a priority by devising a school action plan for creative and cultural education.” (NACCCE 2000 p7). I can recommend to the Headteacher that creativity should be integral to the wider curriculum and a co-ordinator is needed. I also perceive even more crucially that the faculty I operate in should be re- named as the “Creative Arts Faculty”. Within my control and authority these can only be recommendations but I have illustrated the potential that creativity can ignite and the demand it can cause. This action research has encouraged me to employ a variety of strategies to review my practice as a teacher. It has provided me with the opportunity to evaluate the success of a project and reflect on continuing with such a project, which has many learning, teaching and professional development possibilities. Bees,S. (1995) “ How can I respond to my pupils’ educational needs in teaching of History? Sucessfully submitted for the M.Ed Module, Action Research1, to the School of Education, university of Bath. BERA. (1992) Ethical guidelines for educational research. Mc Kernan, J. (1996) Curriculum Action Research. A handbook of methods and resources for the reflective practicioner. Kogan Page. Mc Niff,J., Lomax, P., Whitehead, J. (1996) “You and your action research project: Hyde publications. Ofsted report (1997). Westwood St Thomas Ofsted inspection. NACCCE. (2000) All our futures: Creativity, Culture and Education: National campaign for the Arts. Sharp, C., Dust, K. (1997) “Artists in schools: a handbook for teachers and artists: National foundation for educational research. Smith, A. (1996) “ Accelerated learning in the classroom”: Network Educational Press Ltd.
Whitehead, J. (1999) “ How do I improve my practice?” Creating a discipline of education through educational enquiry. Submitted for the degree of Ph.D. of the University of Bath. FIG 1: Laura’s lobster sculpture. 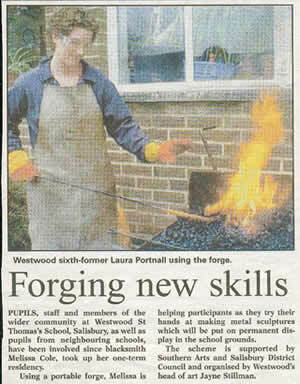 FIG 2: Salisbury Journal cutting of Laura on the forge. FIG 3a: Lucy transferring her cold metal skills to feeder schools. FIG 3b: The Pond Life sculpture. FIG 3c: Becky transferring her skills to different students. FIG3d: Melissa working with a parent and the bursar. FIG 3e: Paul the Caretaker. FIG 4a: Avon Advertiser 28/2/2001. FIG4b: Art Educational meeting to advise about our residency on 6/2/2000. PF1. p2, para 3.My Art Department 3 Year development plan. PF2. p2, para 3.Regional Arts Education Conference: Creativity, Culture and Education: All Our Futures. Conference report (1999). PF3. p2, para 3. Briefing notes about the NACCCE report(1999). PF4. p2, para3. All Our Futures: Creativity, Culture and Education. DFFE summary and report (1999). PF5. p2, para 4. Post conference review. Jayne Stillman. 10/12/1999. PF6. p3, para 3. Creative and Cultural Education: All Our Futures: A summary. (NACCCE 2000). PF7.p3, para4. Westwood St Thomas’ Sculpture Park proposal. PF8.p3, para 4. Westwood St Thomas’ Artist in Residence proposal. PF9.p7, para 2. My reflective diary. PF10.p4, para 2. Laura’s diary. PF 11.p4, para 2. Melissa’s diary. PF14. p5, para 1. Salisbury Journal cutting: 30/11/2000. PF 15. P10, para 1. Audiotape. PF16. p10, para 1.Student’s Christmas card to Melissa. PF 17.p10, para1.Melissa’s comment about the action research topic. PF18. p10, para 1. Isabel’s comment about the action research topic. PF19. P10, para 1.Correspondence from Melissa. To promote and raise the profile of the NACCCE report. To generate debate and discussion. To develop and extend creative partnerships. The NACCCE are a unique group of scientists, artists, educators and business leaders. David Blunkett, Secretary of State, set up the group in 1988 for education and Employment and Chris Smith, Secretary of State for Culture, Media and Sport. Their terms of reference were to make recommendations to the Secretary of State on the creative and cultural development of young people through formal and informal education: to take stock of current provision and to make proposals for principles, policy and practice. My post conference review, 10/12/1999. Discussion at first MA module meeting, ‘Introduction to Action Research’ Dr. Jack Whitehead. 22/11/2000. information and intelligence through the five senses.